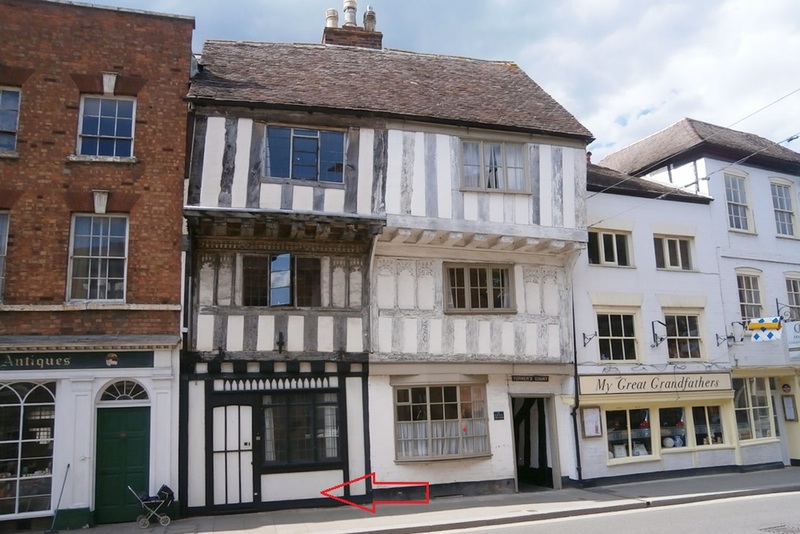 An exceptionally fine and well-preserved medieval town house. Pair of houses in row. Late C15 or early C16. Late C16/17 rear wing, extended late C18/C19. Close studded framing with plaster infill to front, heavy box framing elsewhere, brick underbuild; tile roofs, brick stacks. PLAN: side-entry parallel plan, heated by central shared stack, with lower rear wing making L-plan. 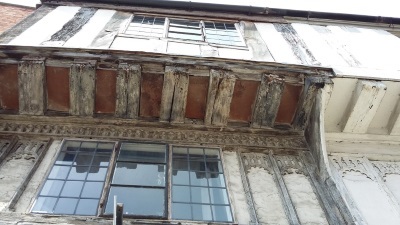 Front is 2-windowed: No.82 has 3-light C18 leaded casement with central opening light to horizontal bars only, above same at first floor, and C20 3-pane shop front with door, left. 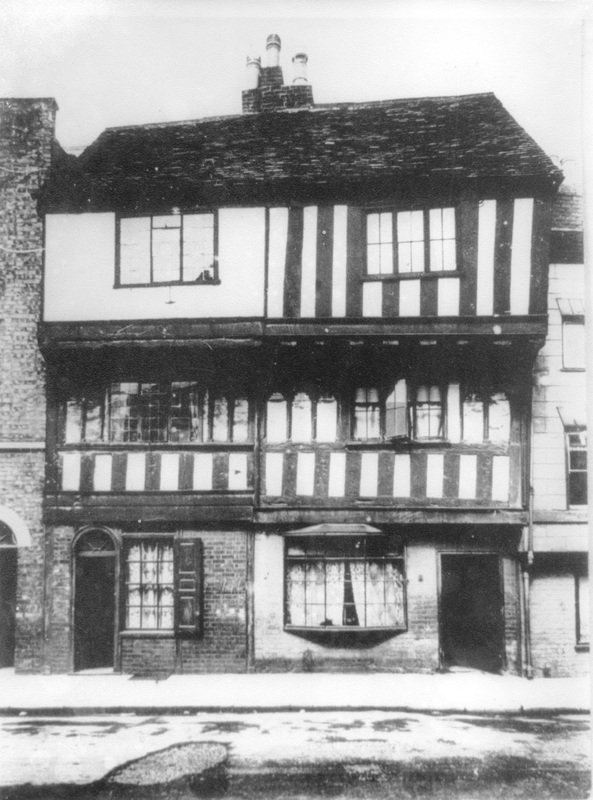 No.83 has 3-light wood casement at first and second floors, with good small-pane timber bow shop front oriel; to right the opening to the alley. 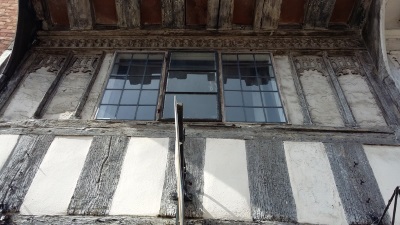 First-floor casement flanked by 3 and 2 cusped panels as to No.82, but slightly wider lights, but bressumer above, not frieze. Large brick stack centred behind ridge, which has some stone ridge tiles. In the brick-paved alley wall to right is heavy timber-frame, to left rendered. Interior of No.83 not inspected, but basic fabric clearly of same date as No.82 and noted as having fragments of late C16 wall painting to first-floor front room including extracts from Psalm 102 and separate text beginning "Honour thy Father..". 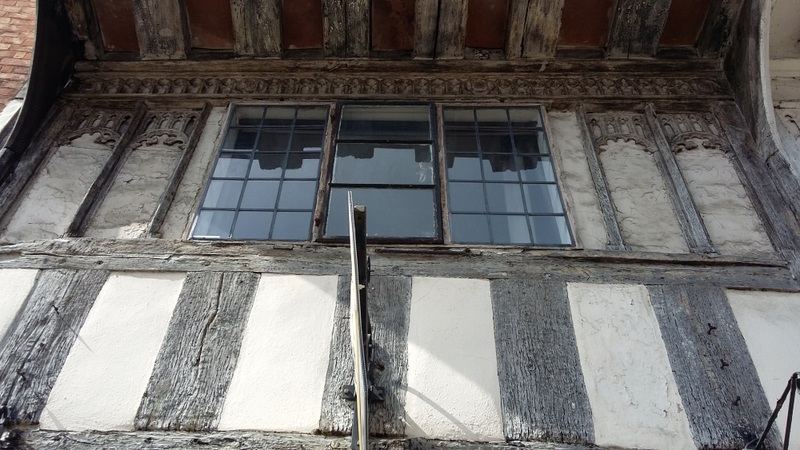 The cusped first-floor panels constitute a very rare example and highly significant of C15 wooden fenestration, particularly for a town house. The first-floor window is flanked each side by 2 delicately carved cusped blank lights, and a carved Perpendicular frieze runs full width immediately below the jetty. This originally would have been a continuous window strip, carried also across No.83. Photographs from John Dixon's archive. The file is dated 1979 although I suspect it is much older. 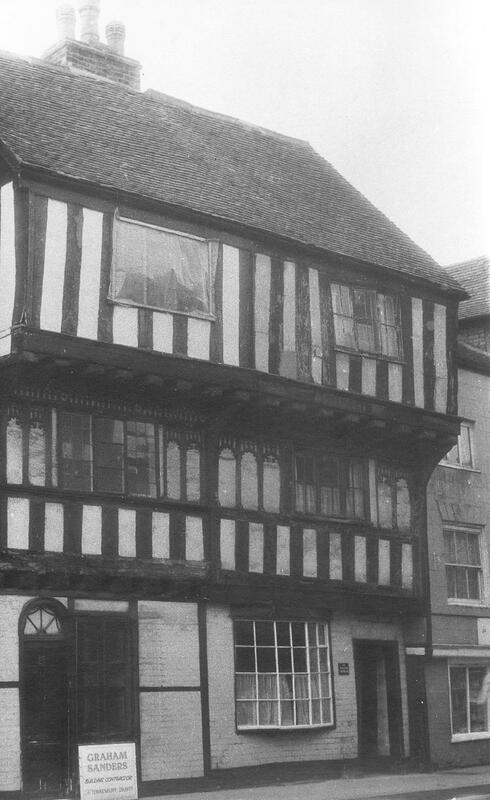 The window is present in older photographs despite it being under repair in this image. Thomas Cull; Male; 57; Builder; Not Born In Gloucestershire. Mary Cull; Female; 58; Not Born In Gloucestershire. Thomas Cull; Head; Married; Male; 66; Carpenter; Born Bradforton(sic) Bretforton? Worcs. Mary Cull; Wife; Married; Female; 68; Carpenters Wife; Born Longdon Worcs. John Penell; Head; Widower; Male; 52; Tailor; Born Tewkesbury Glos. John Penell; Son; Male; 15; Tailor; Born Tewkesbury Glos. Catherine Phelps; Head; Widow; Female; 59; Annuatist; Born Tewkesbury Glos. Catherine Phelps; Daughter; Single; Female; 29; Annuatist; Born Gloucester Glos. Sarah Read; Visitor; Married; Female; 50; Annuatist; Born Eldersfield Worcestershire. Catherine Phelps; Head; Widow; Female; 68; Annuitant; Born Tewkesbury Glos. Kate Phelps; Daughter; Single; Female; 38; Annuitant; Born Gloucester Glos. 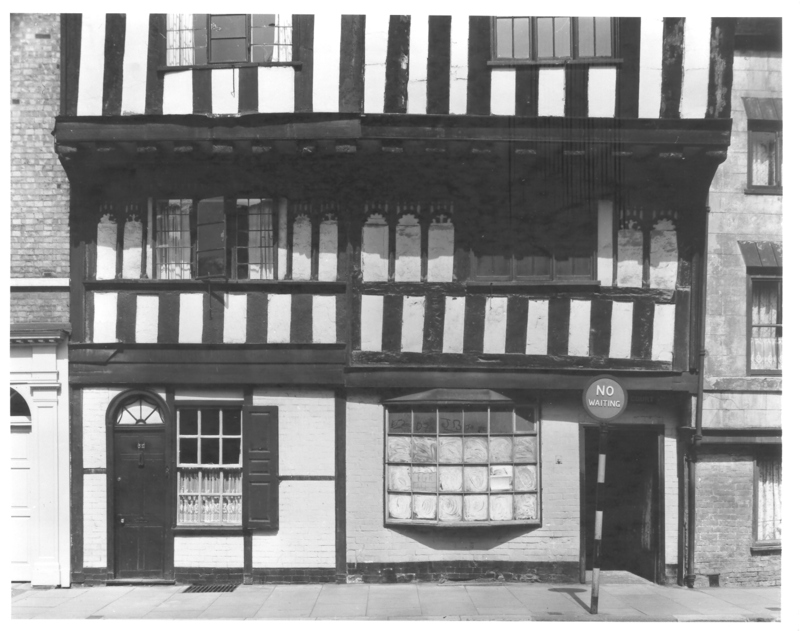 Thomas Davies; Head; Married; Male; 55; Tailor;b. Kington Herefordshire; Employer. Mercy Davies; Wife; Married; Female; 59;b. Corsham Wilts. John Bullock; Male; 40; Journeyman Tanner; Born In Gloucestershire. Elizabeth Bullock; Female; 45; Born In Gloucestershire. John Bullock; Male; 18; Apprentice Tinman; Born In Gloucestershire. Thomas Bullock; Male; 15; Male Servant; Born In Gloucestershire. William Bullock; Male; 14; Journeyman Gardener; Born In Gloucestershire. James Bullock; Male; 12; Born In Gloucestershire. Henry Bullock; Male; 9; Born In Gloucestershire. Thomas Randall; Head; Married; Male; 54; Tailor; Born Tewkesbury Glos. Mary Randall; Wife; Married; Female; 55; Tailors Wife; Born Tewkesbury Glos. Phebe Randall; Daughter; Female; 14; Born Tewkesbury Glos. Caleb Randell; Son; Male; 11; Born Tewkesbury Glos. George Bishop; Head; Married; Male; 71; Shopkeeper Grocer; Born Tewkesbury Glos. Sarah Bishop; Wife; Married; Female; 72; Born Mitcheldean Glos. Elizabeth Phillips; Sister-in-law; Single; Female; 68; Retired Servant; Born Eldersfield Glos. Sarah Bishop; Head; Widow; Female; 81; Grocer; Born Mitcheldean Glos. Elizabeth Phillips; Sister; Single; Female; 78; Annuitant; Born Eldersfield Worcs. Mary Ann Griffiths; Niece; Single; Female; 13; Scholar; Born Sandhurst Glos. Thomas Godwin; Head; Married; Male; 74; Hosier;b. Tewkesbury Glos; Working On Own Account. Sarah Godwin; Wife; Married; Female; 67; Straw Bonnet Maker;Born Tewkesbury Glos; Working On Own Account. Constance A. Turberville; Lodger; Single; Female; 16; Dressmakers Apprentice;b. Overbury Glos(sic); Employed.